Contains milk and soy ingredients. Processed in a facility that also processes wheat, egg, shellfish, fish oil, tree nut and peanut ingredients. Directions: Mix 1 serving (1 scoop) in 6 oz. of cold water or skim milk, or mix 2 servings (2 scoops) in 12 oz. of cold water or skim milk, according to taste, in a glass or shaker cup. Use between major meals and before and after exercise. Read the entire label before use and follow directions provided. 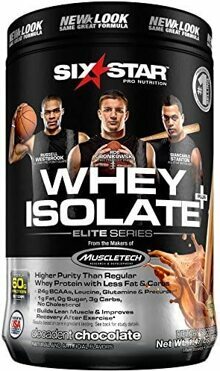 Protein Isolate Blend (whey and milk protein isolate) Muscle Building Recovery Blend (creatine monohydrate, taurine, glycine, l-leucine, I-isoleucine, l-glultamine, l-valine, l-lysine HCL), natural and artificial flavors, gum blend (cellulose gum, xanthan gum carrageenan), Enzyme Blend (papain amylase), salt, acesulfame potassium, soy lecithin, sucralose.